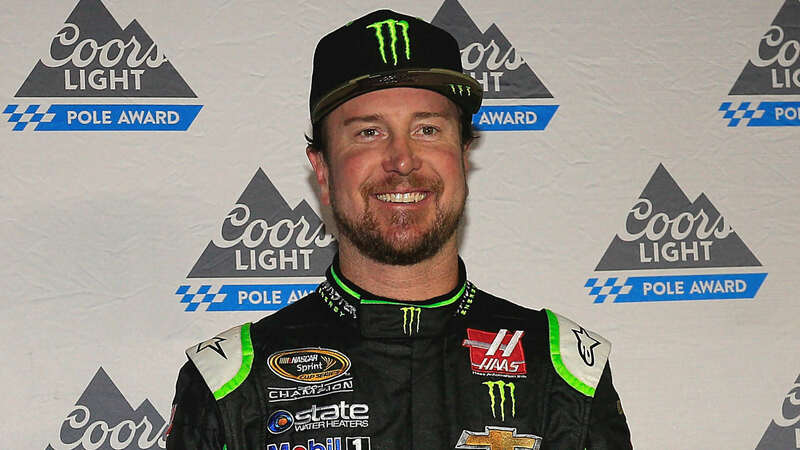 Kurt Busch is on the pole for the 1000bulbs.com 500 on Sunday (2 p.m. ET, NBC) at Talladega Superspeedway. The 40-year-old driver led a sweep of the top four positions by Stewart-Haas drivers. “The way that all of us worked together at Stewart-Haas, I mean, four cars, top four and some of the first handshakes (and) high fives afterwards were with Mobile 1 and Doug Yates and everybody at the Yates Engine Shop,” Busch said. This is the first time Busch has won a pole at a restrictor-plate track. He is in position to make the second round of NASCAR’s playoffs, but a win this weekend would guarantee him a spot in the Round of 8. Clint Bowyer will start second, Kevin Harvick third and Aric Almirola fourth. 1. (41) Kurt Busch (P), Ford, 195.804 mph. 2. (14) Clint Bowyer (P), Ford, 195.301 mph. 3. (4) Kevin Harvick (P), Ford, 195.186 mph. 4. (10) Aric Almirola (P), Ford, 194.571 mph. 5. (9) Chase Elliott (P), Chevrolet, 194.397 mph. 6. (48) Jimmie Johnson, Chevrolet, 194.172 mph. 7. (88) Alex Bowman (P), Chevrolet, 193.768 mph. 8. (24) William Byron #, Chevrolet, 193.768 mph. 9. (18) Kyle Busch (P), Toyota, 193.693 mph. 10. (11) Denny Hamlin, Toyota, 193.380 mph. 11. (78) Martin Truex Jr. (P), Toyota, 192.928 mph. 12. (17) Ricky Stenhouse Jr., Ford, 192.827 mph. 13. (19) Daniel Suarez, Toyota, 192.564 mph. 14. (34) Michael McDowell, Ford, 192.509 mph. 15. (20) Erik Jones, Toyota, 192.162 mph. 16. (38) David Ragan, Ford, 191.996 mph. 17. (43) Darrell Wallace Jr. #, Chevrolet, 191.935 mph. 18. (2) Brad Keselowski (P), Ford, 191.900 mph. 19. (12) Ryan Blaney (P), Ford, 191.731 mph. 20. (22) Joey Logano (P), Ford, 191.386 mph. 21. (3) Austin Dillon, Chevrolet, 191.195 mph. 22. (31) Ryan Newman, Chevrolet, 191.172 mph. 23. (47) AJ Allmendinger, Chevrolet, 190.985 mph. 24. (6) Trevor Bayne, Ford, 190.981 mph. 25. (95) Regan Smith, Chevrolet, 190.662 mph. 26. (37) Chris Buescher, Chevrolet, 190.651 mph. 27. (32) Matt DiBenedetto, Ford, 189.940 mph. 28. (62) Brendan Gaughan(i), Chevrolet, 189.706 mph. 29. (13) Ty Dillon, Chevrolet, 189.699 mph. 30. (21) Paul Menard, Ford, 189.658 mph. 31. (1) Jamie McMurray, Chevrolet, 189.500 mph. 32. (23) JJ Yeley(i), Ford, 189.380 mph. 33. (7) DJ Kennington(i), Chevrolet, 189.234 mph. 34. (42) Kyle Larson (P), Chevrolet, 188.731 mph. 35. (96) Jeffrey Earnhardt, Toyota, 188.367 mph. 36. (15) Ross Chastain(i), Chevrolet, 186.969 mph. 37. (00) Joey Gase(i), Chevrolet, 186.696 mph. 38. (99) Landon Cassill(i), Chevrolet, 186.627 mph. 39. (51) Cody Ware, Chevrolet, 183.136 mph. 40. (72) Corey LaJoie, Chevrolet, 0.000 mph. One driver failed to qualify. 41. (97) David Starr(i), Toyota, 185.880 mph.